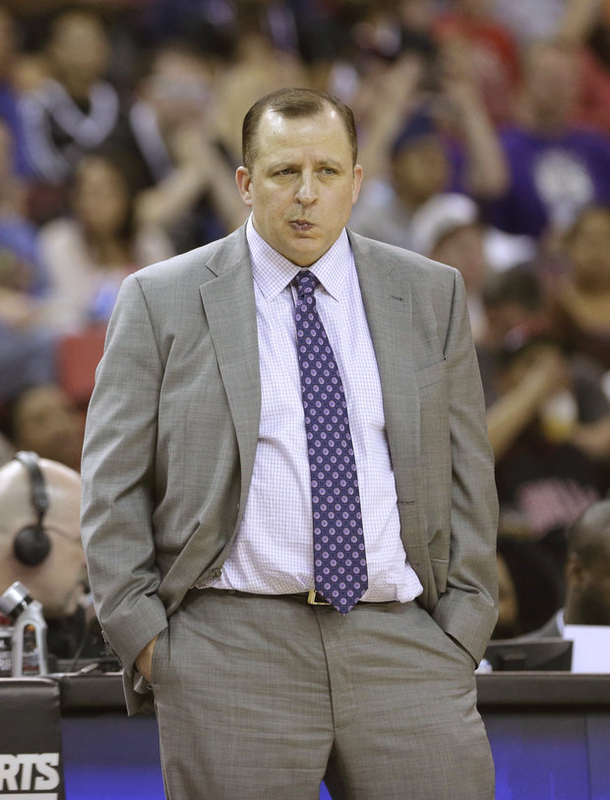 Life has not been easy for Bulls coach Tom Thibodeau. Right now, the toughest job in Chicago sports belongs to Bulls head coach Tom Thibodeau. Last night the Bulls lost another close one: 101-98 to Toronto at the United Center. Thibodeau admitted after the game that they are struggling. You may argue that Cubs manager Dale Sveum has a more difficult gig. But he knew what the circumstances were from the moment he took the job. Thibodeau knew a season without Derrick Rose would not be easy, yet he never made excuses. A season with several other starters on the bench may have been insurmountable for other head coaches. The first two years at the helm of the Bulls, Thibodeau guided his team to the best record in the NBA. In 2011, the club had an exciting playoff run, including the Eastern Conference Finals. Last year the Bulls looked poised for a long run, but the horrible ACL tear to Rose’s knee and Joakim Noah’s badly sprained ankle ended all hopes. Most NBA predictors ahead of this regular season figured the Bulls would be lucky to be a .500 team or even make the playoffs. They will participate in the post-season, but are undermanned. Imagine a coach looking at the bench and seeing starters Rose, Noah, Luol Deng and Richard Hamilton and top sixth man Taj Gibson wearing street clothes instead of Bulls jerseys. Yesterday Hamilton made his first appearance since late February. Marco Belinelli is slowly making his way on the court. Noah has had a set back with his foot injury since playing Sunday in Detroit. There is no known return date for the Bulls All-Star center. This depleted M*A*S*H unit have beaten some good teams and won games no one figured they could at this point. But they have suffered some dreadful losses, including the last two games. The only constant this season had been the Bulls head coach. People not familiar with the day-to-day routine have criticized Thibodeau. These critics think he is too tough on the team. But he has been careful about scheduling practices, especially after a road game. Thibodeau has given his players the day completely off several times, or scheduled film sessions with light work-outs. It has to be a difficult decision considering this coach loves to teach and practices are where that work is done. Another thankless aspect of Thibodeau’s job has been answering every question concerning Rose&apos;s return. He is asked after every practice, before and after games. With only five games left, the odds of the former MVP coming back are slim. At this point is makes little sense. The team’s front office made several impactful choices this season due to Rose’s status, particularly with the bench. How nice it would have been to have Omer Asik, Ronnie Brewer, C.J. Watson or Kyle Korver to be part of this team. Several players on this year’s roster, like Jimmy Butler and Nate Robinson, have been helpful putting the Bulls in the position they are right now. However, this team seems to be running out of steam.